The author is Richard A. Epstein. If you are ready for the mathematical dive into the gambling world, this book is just for you. The author covers mathematic matters, which concern the gambling world, throughout the centuries. In all times all the people tried to explain the phenomena of chance. But the thing was that before the times of Renaissance people did not know about the nature of probability. The gambling was known even in times of Paleolithic age, because the archeological findings are the polished knucklebones and painted pebbles. It is interesting how Richard A. Epstein tells us about the theory of probability was developing. People started researching this matter, but I doubt they knew what they were exactly looking for. In 1663 The Book on Games of Chance was published, where Gerolamo Cardano, the author and the physician, philosopher, gambler and murderer, attempted to describe the concept of chance events. Well, if you do not like books, which explain how everything started, you might like to read "Casino Gambling: A Winner's Guide to Blackjack, Craps, Roulette, Baccarat, and Casino Poker", where the basic rules described and other useful information about the casino games. This book is more of a scientific approach to the gambling but at the same time it is so easy to read, except some Latin words and weird names from the past, which are were very important for the development of mathematics. The book is logically set. 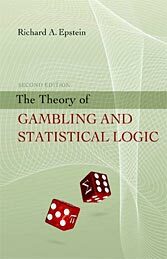 The author first tells about mathematical preliminaries, explains the meaning of probability, statistics and game theory. He goes ahead and covers the Parrondo's principle or paradox. Also Richard Epstein describes the biased coins, statistical properties of coins and the coin games, so that the gamers would not be so naïve. He does the same with the dice and their probabilities. The card games are described from the beginning of their history till nowadays, including shuffling, which not always is random. Fallacies and psychological aspect are also covered, which makes the book closer to us, more interesting and useful. If you are patient and want to know how everything started, this book is for you!